Jeanne Louise Foster, 93, of Kansas City, KS, passed away Wednesday, August 22, 2018. Visitation will be from 4:30-6:30 PM Sunday, August 26 at Porter Funeral Home, 1835 Minnesota Avenue, Kasnas City, KS. Funeral Mass will 10:00 AM Monday, August 27 at St. Mary-St. Anthony Catholic Church. Burial in Chapel Hill Memorial Gardens. In lieu of flowers the family suggests memorial contributions to the Kansas City Hospice House and St. Mary–St. Anthony Catholic Church. Jeanne was born December 27, 1924, in Kansas City, KS. Jeanne graduated from Argentine High School and from the University of Kansas, where she was a Chi Omega and was a lifelong Kansas fan. She was a homemaker, a gourmet cook, and a fabulous hostess. She loved entertaining family and friends and rarely was an invitation from her declined. She was known as an elegant, classy lady by all who knew her. 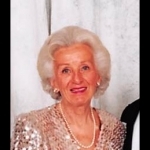 Jeanne served as an officer of several volunteer organizations over the years, including the Junior League of Wyandotte and Johnson Counties, the Friends of the Arts, the Monday Club, the Phi Psi Mothers’ Club, and the Chi Omega Corporation Board. Jeanne was preceded in death by her husband of 43 years, The Honorable Robert J. Foster, in 1991, and her brother, RJ Atkinson, Jr. She is survived by her children: Cliff Foster, Nancy (Dennis) Browne, grandsons; Ryan (Alli), Adam, Mark (Erica), great grandson Mark, Jr. (MJ) Browne, and a long list of nieces, nephews and extended family. Nancy and family, we are so very sorry for the sudden loss of your mother. She was one of a kind--true class. Please know that you are all in our thoughts and prayers. I am so sorry for your loss! Prayers are with you all. Cliff and Nancy: Sorry to read of the passing of your mom. Your parents were wonderful people and Wyandotte County is not the same without them. We will keep both in our prayers. We wish to offer our sincerest condolences on the death of Jeanne, She will be remembered in our prayers. May she rest in peace.